In a 1995 feature article on Barry Halper, Sports Illustrated presented Halper's shotgun as the one used to kill Cobb's father. SI noted that Halper acquired most of his "Cobbabilia" from Al Stump. Everyone from Sports Illustrated to a Hollywood director bought it hook, line and sinker as Barry Halper showed off his Ty Cobb collection at his home in Livingston, New Jersey. Based solely on the word of Halper and Al Stump, items like the shotgun used to kill Ty Cobb’s father and Cobb’s handwritten personal diaries were presented to the general public as authentic pieces of important baseball history. The infamous shotgun allegedly ended up in the collection of an ex-Yankee player and one Cobb diary was even donated by Major League Baseball to the Baseball Hall of Fame in Cooperstown. Now, over a decade after these items first appeared on the pages of Sports Illustrated and a Sotheby’s auction catalogue, an investigation conducted by a board member of the Ty Cobb Museum has determined these once-venerated items are far from genuine. Thanks to his research, a long-standing baseball fraud has been exposed and the record is finally set straight. In 2006 Ron stumbled onto the popular baseball blog by noted baseball author and historian, John Thorn. 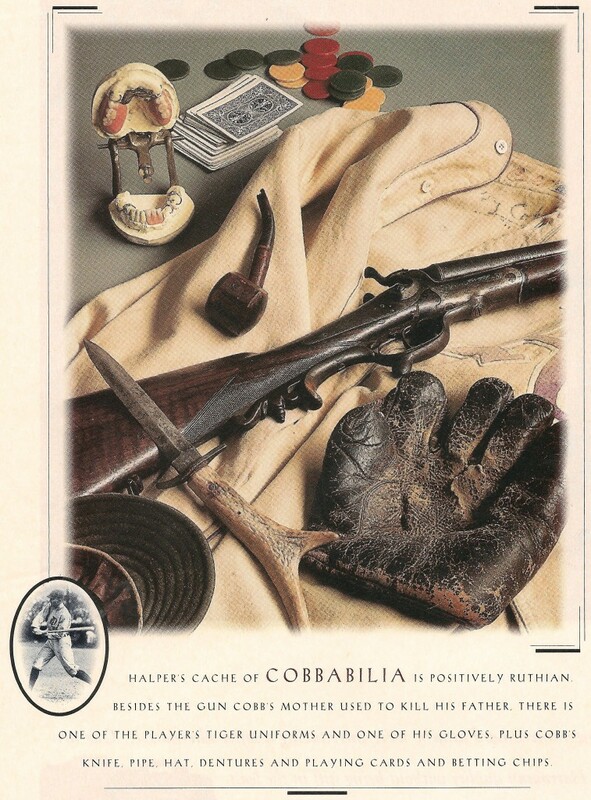 In his tribute after the passing of Barry Halper in 2005, Thorn mentioned that the shotgun which killed Ty Cobb’s father was part of the Barry Halper memorabilia collection. Thorn was a friend of the Yankee minority owner and had viewed and written about Halper’s extensive baseball memorabilia collection – the largest, most renowned and most valuable in the world. On his blog, Thorn was simply recounting Halper’s self-proclaimed ownership of a relic that was included in a 1995 photo spread in Sports Illustrated and in the 1999 Sotheby’s catalogue created for the sale of Halper’s collection. Not to mention that the “shotgun story” had already been memorialized on the big screen in Ron Shelton’s bio-pic Cobb, starring Tommy Lee Jones as the Georgia Peach. The August 9, 1905 shooting death of Ty Cobb’s father at the hand of his mother, when Ty was only 18 years old, was an extremely traumatic event in Cobb’s life. Some even say it was a defining event, likely responsible for the super-aggressiveness of Ty on the playing field. This tragedy occurred three weeks to the day before another defining event in Ty Cobb’s life – his first game in major league baseball with the Detroit Tigers on August 30, 1905. That the weapon used by Ty’s mother in the shooting of his father would be a part of the largest collection of baseball memorabilia ever assembled seemed strange. Ron was intrigued that the principal artifact of this tragedy would have survived for over 100 years to become a part of such a well respected collection. He was also skeptical, since he knew that at least one Ty Cobb biographer, and one close friend of Cobb’s (his personal bat-boy in 1924-1926) claimed that a pistol, rather than a shotgun, had been used in the shooting death of Ty’s father. What’s the difference, you may ask, between being shot dead by a shotgun and being shot dead by a pistol? To Professor W. H. Cobb, Ty’s father, there is no difference, of course, as his death was instantaneous. To Ty Cobb, however, and to the mythology which has surrounded him since his own death in 1961, there is, at least Ron’s opinion, a very large difference. Even a cursory look at the biographical literature on Ty Cobb will reveal descriptions of an extremely gory death scene at the W. H. Cobb residence – one which reads like the climax of a Gothic horror story. Time and time again, sportswriters, commentators, bloggers and historians alike have described in detail how Professor Cobb’s head was blown off, so that “not much was left,” and how his abdomen was opened up by a second blast of buckshot that scattered most of its contents all about the grisly scene. Surely, Ty Cobb’s own reputation was not damaged by this tale, as he was not involved. He was a hundred miles away in Augusta, Georgia, in the final days of his minor league career. But, the repeated re-telling of the sordid story of this tragedy, year after year, does set the stage and the tone for a host of the other negatives about Ty Cobb and the mythology which still surrounds him. Ron saw this tragic and violent event as perhaps one element of the Ty Cobb myth that could be definitively settled. To do so, Ron posed the following questions: Were there historical records that stated what weapon had been used? If a pistol was actually used, where did the shotgun story come from? If the shotgun was in the Halper collection, how did it get there? And, where was the shotgun for the nearly 100 years between the shooting and Halper’s acquisition? What began as a curious look into an unbelievable statement now led Ron to study the historical records on this event and to review all the biographical literature on Ty Cobb. In an unexpected twist, Ron’s investigation ultimately led him to delve into world of high-end baseball memorabilia – where prices sometimes reach into the millions of dollars for a single coveted item. It was there that Ron discovered the dark side of the shotgun story, and the entire baseball memorabilia hobby. Frauds, thefts and forgeries are rampant, causing untold loss of time and money, even damage to careers and reputations – both individual and institutional. More disturbing to Ron was the discovery that the deceit in the frauds, thefts and forgeries has sometimes infected the history of baseball, and its culture as well. 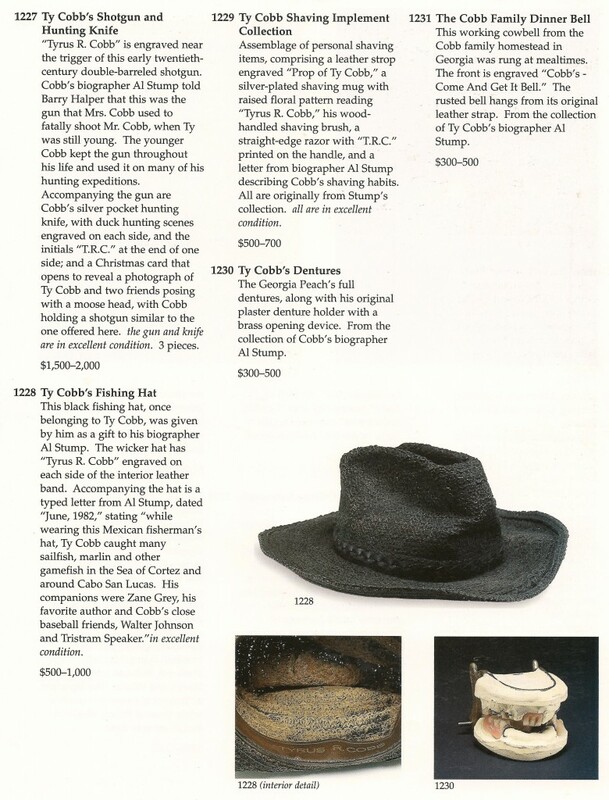 Page from the 1999 Sotheby's catalogue for the Barry Halper Collection, featuring several dubious items originating from the collection of Al Stump, including the infamous Cobb shotgun. Very interesting story and it makes me wonder how more items in the Halper collection deemed authentic were actually not and one big question still remains ,how he acquired all of the Babe Ruth items he had and how he got them or from whom and how that person got them and from whom,or ???????????? Mr Cobb writes that hobby expert Josh Evans of Lelands informed Barry Halper that materials coming from Stump were bad or suspected to be forged. This was years before his sale at Sotheby’s. So it seems Halper and Sotheby’s sold off all of the Stump material anyway- with knowledge of the problems- and they also admit that they pulled the shotgun because of these suspicions. What similar problems existed with Halper’s other “collections”??????? Ron, Very nice article. It shows that you put a lot of research and thought behind it. Hopefully, if we can keep putting out articles like this, maybe someday the un-truths about Cobb will be a distant past. For every “rumor” about his bad side, I know we Cobb fans can come up with a hundred other stories that would contradict those “rumors” and show what a real gentleman he was. When are you and Wesley coming out with a book? This article could be the heart of a great book. I think it’s time to take the word “amateur” off “amateur baseball historian” when describing Ron Cobb. Great work, Ron !!! Always remember, ” LET THE BUYER BEWARE “, as this is the most important thing to keep at the forefront. 1. That Sotheby’s seems to have sold all of Halper’s Stump/Cobb material knowing there were problems related to authenticity. Is Ron a relative of Ty Cobb? Superb investigative journalism by Ron Cobb. The Stump book and article were always great favorites of mine. I also loved Alexander’s book. Ron Cobb, I sincerely hope you will someday write the definitive Ty Cobb biography. event that changed my life”. Ty’s mother testified in court. She said she used a pistol. Compliments to Ron for excellent sleuthing. haulsofshame.com – da mejor. Guardar va!